Lobuche east peak 6119m is famous trekking peak in Everest region. Lobuche peak is an attractive summit, offering a variety of existing routes and wide scope for new lines of Everest region trekking. Lobuche peak first ascent was by Laurice Nielson on 25 April 1984. Lobuche peak offers superb Himalayan panoramic views including the Mt. Everest, Mt. Lhotse, Mount Nuptse, Mount Amadablam, Thamserku , Kantega, Pumori , Island peak etc with the dark triangle of its rocky east face rises down the moraines of Khumbu Glaciers to a pleasant skyline, forming the south face. 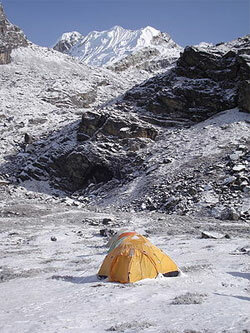 Since Everest trekking trail has been open Lobuche peak is frequently climb by foreign mountaineers. Lobuche east peak is known as the false peak. From the summit, you have a great view of Mt. Everest and a 360 degree Himalayan panorama that includes all important peaks in the Khumbu Valley. After a magnificent mountain flight Kathmandu to Lukla , Apex Nepal Adventure Treks and Expedition professional guide will take to you Dudh Kosi valley to Namche Bazaar. The climb includes some technical difficulties on quite steep (45 - 50 degree) snow/ice slopes and requires the use of fixed ropes. After the Lobuche Peak ascent, we continue towards Gorak Shep and climb to Kala Pattar (5545 m) from where we enjoy an impressive up-close view of Everest. Our return route passes through Tengboche, a magnificent location with a fascinating monastery, where we rest and savor the incredible scenery, including magnificent views of Everest, Ama Dablam (6856m), Kantega (6809m), Kwangde (6194m), Nuptse (7879m), and Lhotse (8511m). We Apex Nepal Adventure Trekking and expedition will arrange the Lobuche east peak climbing according to trekkers /mountaineers holiday schedule and wish. Day 02: Kathmandu. Briefing and shopping. Day 04: Trek to Namche Bazaar (3446m). Overnight in lodge. Day 06: Khumjung. Acclimatization day. Day 07: Trek to Tengboche Monastery ( 3867m). Overnight in lodge. Day 08: Trek to Dingboche (4347m). Overnight in lodge. Day 09: Trek to Lobuche (4900m). Overnight . Day 10: Lobuche, rest day for acclimatization. Day 11: High Camp ( 5357m). Day 12: Climbing Period Mt. Lobuche East. Day 13-16: Trek to Lobuche..
Day 17: Trek to Dingboche. Day 18: Trek to Khumjung. Day 19: Trek to Phakding..
Day 20: Trek to Lukla..